Earlier today we waxed poetic on the history of college football in the morning portion of our weekly roundtable. This afternoon, we return as TSS Associate Editors Bart Doan and Terry Johnson join Kevin Causey and a rotating special guest in our weekly roundtables discussing all things college football. This morning we discussed some of the most epic games in the history of college football. This afternoon, we look at more specific memories as we are joined by Scott Halasz of The Buckeye Battle Cry. Question: What’s your favorite college football memory? I was living in South Bend. I was 7 or 8 so it was around the 1987-78 season. My family lived in some condos near the Notre Dame campus. A lot of players who were married lived there because of the proximity. We became friendly with a guy named Rick Slager. He was the starting QB at the time. When they went out of town we would watch their dog muffin. One day he called me and my brother and my mother up and asked if we wanted to meet a teammate. We said sure and went over there. Rick introduced us to his backup QB. The teammate asked if we wanted to throw some passes. My brother said no, you’re the backup. He then asked my mom if we could go back home. So we never threw passes with that QB. Never got a picture or an autograph. Oh well, right? His name? Some guy named Joe Montana. Personally, I tend to look at memories from the standpoint of who you were with rather than what the situation or game was, so I probably single two moments out that happened rather recently considering all things and weren’t games that are going to register on anyone’s historical radar. The first was in 2011, Michigan and Notre Dame (damn, I’m going to that well a lot today). We had all the family over, the food and brew flowing, and it was one of those perfect nights out that was warmer than you’d expect enough to leave the windows open so anyone in a 2 block radius can all hear you cheering (sorry, neighbors). Michigan was dead to rights and the beer tasted pretty crappy heading into the fourth down 24-7. The rest is history, with Michigan coming back to lead with just over a minute left by four, then seeing Notre Dame take the lead back with 30 seconds, only to see Michigan go 80 yards with a Denard Robinson to Roy Roundtree touchdown that blew the roof off our house. Hell, we cheered so loud and hard, I even ran outside hugging random people that I’d never talked to in the year-plus since moving there. It was just a great time, and that sort of moment that, being with family celebrating that stuff, is what you live for. The second moment is from two years ago, pretty awful Michigan who couldn’t score in a monkey brothel with a satchel of bananas, and pretty awful Northwestern in Evanston, our first trip there. It was cold. Really stinking cold. And it rained the entire time we sat there cheering our butts off over mostly nothing, because there was all of one turnover and zero touchdowns in regulation. It was three hours of mostly punts and people slowly filing out. In the end, Michigan kicked a field goal with 1 second left after running the team out there, pushing it into three overtimes, eventually winning 27-19. Obviously, we stayed the entire time, hollering as if it was the BCS Championship. Like I said, in the end, you lie there looking back on it all sifting through all you have left at that point, which is your memories. And the best ones are made in good company, regardless of the gravity of the situation. The year was 1980 and the Bulldogs were coming off of a 6-5 season. Georgia had built an 8-0 record and had moved up the polls and vaulted to the second spot with a victory over South Carolina. The next test was the No. 20 ranked Florida Gators. The hard fought game came down to one drive for Georgia as the Gators led 21-19 and the Dawgs had to go the length of the field. 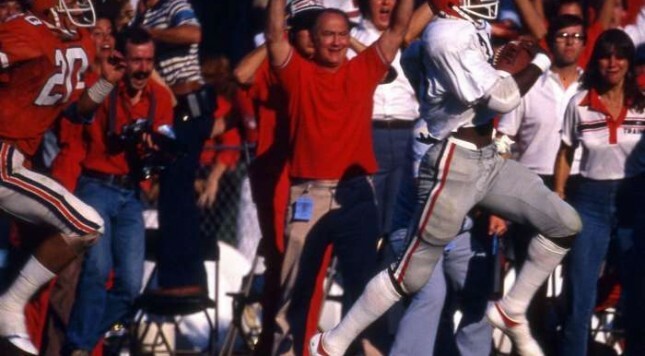 Georgia freshman Herschel Walker had over 200 yards rushing but with the ball on their own eight and just one minute left, Herschel could not save them from defeat. Georgia would have to turn to their quarterback Buck Belue who had completed just 6 of 15 passes in the game and had thrown two interceptions. Georgia essentially needed a miracle to pull this game out and to keep their National Championship hopes alive. Belue dropped back and was flushed out of the pocket as he escaped Gators in the end zone and hit Lindsay Scott on the 25 yard line. Scott turned around and then with the entire Florida defense chasing him proceeded to score one of the most legendary touchdowns in the history of college football. Here’s the historic call from Georgia icon Larry Munson….. In our morning roundtable, I mentioned that if I could attend one game in college football history, I would have opted to see the 2007 Fiesta Bowl. While that contest had a number of spectacular plays in it, it surprisingly was not my favorite college football memory. That moment would come in the 2001 MAC Championship Game. Although this memory took place almost 15 years ago, I still remember that contest like it was yesterday. While Marshall opened up an early 23-0 lead, Toledo fought back to cut the lead to 29-24 early in third quarter. Faced with a fourth-and-six at the Thundering Herd 16-yard line, Tom Amstutz sent his field goal unit out. What happened next was something I’ll never forget. Instead of taking the points, Amstutz called for a fake field goal. The snap went to quarterback Tavares Bolden, who flipped it over his shoulder to Rocket kicker Todd France who sprinted untouched into the end zone, running into the goal post along the way. This unexpected touchdown gave Toledo a 32-29 lead, and made the difference in this contest. The Rockets would go on to win the game and conference championship 41-36. It’s quite ironic that a matchup that featured future NFL players Byron Leftwich, Chester Taylor, Darius Watts, and Lance Moore would be decided on a play affectionately dubbed as “Nerd Up the Middle”. That’s why it’s my favorite moment in college football history.